The previous article shared a few strategies and ideas for quickly trapping groundhogs that have become a nuisance in the backyard garden. But trapping is only half of the battle, once the critter is caged you still have to determine what to do with it next? To begin with, resist that temptation to take out a little vengeance for all the havoc that the groundhog has caused; remember that this little pig was simply doing what it does best… Eat! I was pretty annoyed when I learned that the greedy groundhog feasting on the veggies in my garden refused to touch a thing in my neighbor’s unfenced garden that was much closer to his home, and instead saved his appetite for my garden. Whatever his reasoning, I wasn’t at all pleased with that particular groundhog and the favoritism displayed towards my fresh vegetables. Guess I should have taken it as a compliment that Mr. Woodchuck considered my produce to be such an exclusive treat on his menu. No matter how it may seem to the gardener whose garden in under attack, it really isn’t anything personal and the groundhog is not out to make life miserable, destroy the garden, or cause you to lose all self-control as your cherished plants are wiped out! So rather than exact revenge, let’s just take care to relocate the animal while causing it as little additional stress as possible. The first step is to keep in mind that you’re dealing with a wild creature, and a trapped animal has the potential of being diseased, or can attack in an effort to escape from its predicament. Be careful to protect yourself and others from harm during the process of capturing and releasing your trapped groundhog. That includes ensuring that the trap is secure and that fingers are kept outside of the trap at all times. Those teeth aren’t just for eating, and many trapped woodchucks will put on a good display to convince you that they do mean business. You may want to wear gloves but don’t fool yourself into believing that they offer any real protection against an animal bite, scratch, or puncture. Don’t touch or handle the groundhog and be alert to any indication that it is injured or diseased. If the animal exhibits any sign of sickness or behaves in an abnormal manner contact an animal control officer rather than attempt to release the creature back into the wild. Once your safety is accounted for you need to consider the welfare of the animal. Use a live capture trap, such as a Havahart that won’t physically harm the woodchuck. And the time to familiarize yourself with the release procedures for your particular trap is BEFORE there is an animal actually in the trap! DON’T leave trapped animals unattended for any length of time. You would be unpleasantly surprised by how quickly a caged animal can die from exposure, especially on a hot, sunny day. Don’t leave a trap set if you will not be available to check it and tend to the animal within a period of a few hours. 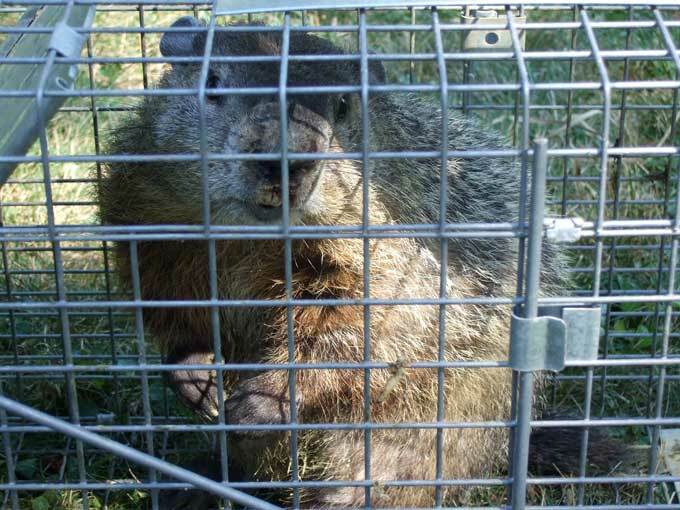 If there is a temporary delay in releasing a trapped groundhog the trap should be moved to a shady area to provide relief from the ultraviolet sun rays that can be very harmful to a caged animal. During transport a stressed or agitated animal in a trap can be calmed and quieted by covering the trap with an old blanket or tarp, just make sure that it allows for good air circulation and will not cause overheating. Before moving and releasing your trapped groundhog it may be a good idea to check out the local state game regulations in your locality. After contacting the PA State Game Commission in my jurisdiction, I was told that I could release the groundhog pretty much wherever I pleased. That sounded a little odd, but I didn’t ask twice. I did however look around to identify a good location where I felt the animal would be safe and happy upon its release, and would not create a problem for anyone else. Avoid releasing your pest in residential areas, near active roadways, around other gardens or farmlands, or in environments that would not provide suitable cover, vegetation, and the type of terrain that a groundhog would need in order to survive. And I could be wrong on this point, but I also try to release the groundhog during daylight hours so the animal can become acclimated, find a new home, and settle down before darkness sets in. The official Veggie Gardening Tips Groundhog Preserve where I release my trapped woodchucks is located about four miles from my garden. 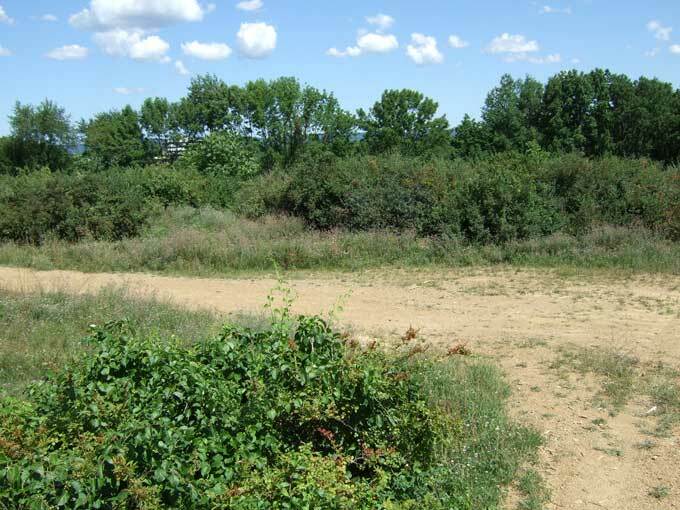 It consists of a sprawling tract of uninhabited land with a varied mix of hills, brush, tree lines, and open fields that should make an ideal home for raising baby groundhogs. I’ll have to tell Marc from Garden Desk to swing by. seems he’s up to his elbows in groundhogs right now. Great guide, Kenny! Thank goodness I only get squirrels! Hi Emma, Marc has been by and we’ve talked a little bit about dealing with groundhog problems. Count you blessings if you don’t have any groundhogs in the vicinity of your garden, but those squirrels can become a nuisance also. LOL, the squirrelies are nothing compared to the dog who thinks that my garden is really the lost Eden on the other side of the fence and his goal in life is to dig under/around/through the fence to get to the promised land! That and he keeps the squirrels away when he’s awake! Thanks for your reply about my groundhog problem. I’ve come to some decisions about the problem, for now. Seeing as how my plants are already decimated for the season, I have been researching local pumpkin farms to visit this year with my 3 year old son. I think he will get a kick out of that, probably just as much as he would be growing his own. I’ve decided not to hold a grudge against the groundhog. My family owns a restaurant and I have been having them save the veggie scraps for me and so each evening I go out with the scraps and “slop the hog”. Since there is nothing left in my garden for him to eat, I thought he might be hungry. I can hear you screaming. Please don’t 🙂 I’m an animal lover at heart, and I love even the destructive ones. I don’t want him to starve or go near my pool and drown so I am trying to appease him in the area that he is in. I was afraid to foul his house because I thought that he might go up near the pool and it’s always tragic when I find an animal in there and I feel terrible about it. I am devising a plan for next year, while trying to keep everyone happy for the remainder of this season. Next year I will either build a fence, or I will make the decision to trap and relocate the groundhog before he can produce hoglets. I’ve also read about fox urine as a repellant.. umm.. who and how do they collect fox urine? But then repelling him is not really an option unless I treat my entire yard.. because of the water hazard. Another option I thought of was to possibly research if there is anything that groundhogs definitely won’t eat, and try to grow that next year. I thought he wouldn’t touch peppers, but seeing as how the pumpkins are now gone he has decided that pumpkins and eggplants are palatable. So I am not really sure that there is anything he won’t eat. I did see him chewing on a weed the other day, and I thank him for that at least. Interesting, my trap only ever caught skunks. I use a .22 air rifle now, its a quick kill. No more woodchucks for me. Just found your info on catching groundhogs–so far this season I’ve trapped 6 and my neighbor got 1. I was researching groundhog’s range when I found this article–some of the ones I trapped look awfully familiar and I’m wondering if they’re smart enough to find their way back but not smart enought not to get caught again. I’ve been taking them across a significant river to a commercial/industrial area where there are weedy, overgrown lots and areas of trees, a large stream and the aforesaid river. If they didn’t take the bridge and swam the river, though, they’re probably not even two miles from their former home. Do you think they can come home? Animal control has been in my neighborhood for two months trapping groundhogs and they keep coming back. I’m wondering if they are taking them around the corner and letting them go or what.. I don’t hate the groundhogs, I just wish I could have a veggie garden. There is a pretty cute set of triplet babies that we’ve watched grow this season. They leave my ornamental plants alone for the most part and I saw one chewing on a weed once so I guess they can stay… and honestly, what choice in the matter do I have really? I’ve recently bought a “Havahart” electric fence. I’m hoping that this will keep the critters out. By the way… im finding that ive got more of a rabbit problem than groundhogs. Ive shot 2 groundhogs.. but 8 rabbits… now finally we crops are recovering. Margaret, I guess your groundhogs could find their way back but I doubt that they would put much effort into returning even if they could. Although I had a friend that was trapping possums and swore that the same one was returning so he marked it with a touch of paint and sure enough he trapped the same animal again. Evidently it was smart enough to find its way back home but not smart enough to stay out of the trap! Gerri, maybe Animal Control has worked out some kind of agreement with those groundhogs just to keep themselves busy! 🙂 Maybe you could follow them the next time they leave with a groundhog. I really would try to relocate the critters… they may leave your ornamentals alone for now but that may change next year or when the the triplets begin raising families of their own. Simon, good luck with the rabbits… maybe you need a nice dog to convince the rabbits to move on to greener pastures. so I moved the trap close to the hole/changed the food and blocked both sides of the trap and by morning a small raccoon was it. I assume the woodchuck left because the day before, I turned my hose on and into the hole for 15 minutes. This was all done in my neighbour’s yard because they worked and didn’t mind my effort. The cage sat outside for 8 hours before the exterminator picked the cage up and they do not drop them off elsewhere from what I heard. ground hogs driving me crazy.under my house.gonna try traping but i know there are 4 at least under there.will the babies trap easy and are there any ground hog smoke bombs.if i did that would they still come back. and is there somthing i can put around there to keep them away from my house. or reg. smoke bombs will they work. I have my doubts regarding fox urine as a repellent for groundhogs. My nuisance “chuck” pretty much shares a den with my five red fox pups. They are all currently living in a large hollow beneath an old machine shed (perhaps in two separate hollows)… I don’t ask any questions regarding their arrangement. I say that they are “currently” living together in perfect harmony because I have just got a Havahart live trap as mentioned in the previous article. Once I get my paws on suitable bait, Chuck will be chucked out into a more secluded and suitable environment. I have fenced yard, but these critters just keep digging under fence since putting in garden, they wiped out all my lettuce and then started on broccoli, so had to do something as I plugged a dozen holes under fence. Saw only one, and saw one became road kill, so I thought God had taken care of my wish to get rid of these pests. Well, there was a big one who dug a giant hole, so I guess a family is raiding my garden. Went and bought a Havahart and after a couple weeks of no action, got him. Sadly, I was out for the day, and by the time I got home to see trap, he had just died. Ate every bit of vegetation under trap, so I wondered why he died, it was a hot day, so curious. Anyway, hope there are no more, not fun getting rid of them being dead, don’t like to kill them, so a bit sad to think he may have exhausted himself trying to get out and had a heart attack. Peanut butter on half an apple works every time as bait. The selfishness of all you people whining about a freaking groundhog or woodchuck is mind-blowing. Do you understand that by trapping and relocating an animal especially during March through August it is a very good chance that it is a mother with little babies depending on the mother for survival. So just because you’re all pissy about your precious Garden being eaten you have no issue with starving a family of baby woodchucks or groundhogs. I’m willing to believe that not all of you thought about the possibility of babies but I’m pretty sure that some of you have thought about it and just don’t care. Do a better job of securing your garden, make sure your fence is down deep enough in the ground that the woodchuck can’t dig under it or climb over it. The problem is so many people don’t want to do any work and they think it’s okay to just do whatever they want to Wildlife because unfortunately most humans are selfish. And just for the record I do have a garden and I just make sure that it is adequately protected so that way nothing can get under the fence or over it. Put the damn effort in and maybe you’ll see some good results. I swear, all anyone cares about as the easiest fix. Next post: Marigolds; Just a Pretty Flower or Much More?